I recently read that Maria Kouneli would be talking at Yale College regarding: "The Whistled Language of Antia: Strategies for Revitalization"
This sounded very interesting, so I took some time to look into it further. I have listed links to some interesting videos and articles about this. It would be such a shame if this way of communicating is lost forever. "The Whistled Language of Antia: Strategies for Revitalization"
Whistled speech is a rare form of speech, in which phonetic cues from spoken language are emulated in whistled form so that dialogues can take place over long distances. 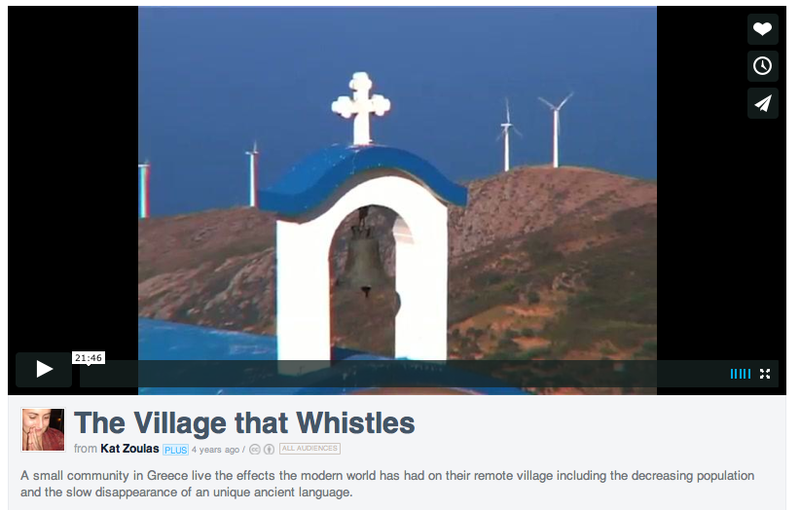 The whistled language of the village Antia in Greece is one of the only two such languages in Europe and is, unfortunately, severely endangered. In this talk Maria Kouneli will discuss the details of what is meant by the term "whistled language", evaluate the endangerment situation in the case of Antia, discuss the revitalization possibilities for the language, and present facts on the latest realized efforts for the preservation of the language.